Surgeons operate on a child at the University Of Nigeria, Nsukka Teaching Hospital Ituku/Ozalla. 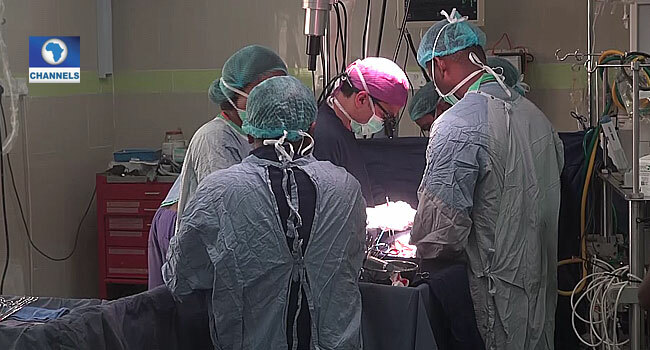 Twenty-four children with congenital heart diseases have benefitted from the Open Heart Surgery program of the University Of Nigeria, Nsukka Teaching Hospital Ituku/Ozalla. The free surgery was done in collaboration with a team of doctors from India, who extended their charity works to Nigeria, through their project tagged: The Gift Of Life. The delegation, however, expressed worry over the size of the hospital facility and promised to partner with the hospital to improve its overall quality and efficiency. On its part, the hospital management said it was happy about the opportunity not just to perform more surgeries but the opportunity for capacity building. The Chief Medical Director (UNTH), Dr Chirs Amah, said, “We’re building capacity for the staff of the hospital because it’s not just about coming to do surgery. “What is even more important is the exchange of skills, knowledge and all that. We’ve been doing Open Heart surgery right from 1974 till 2003 when it stopped, particularly due to the relocation of the hospital from the old site to this place. So, there was a ten-year slip before 2013 when we re-activated it again. So, the local team had lost their skills and so many things had gone bad. “Reactivating it and getting all these collaborators from overseas, our people are increasingly able to regain their skills, there is a lot of knowledge transfer and as part of the MOU, some of our own staff go there”. Speaking further, one of the members of the delegation, Ricky Sharma, noted that over 68,000 children are estimated to be born with heart diseases. He, therefore, called on the government and other concerned individuals and groups to support the cause. “We do request the parastatals in the highest order to support us monetarily, giving us concessions, grants, to bring in the materials, logistics, medicines that are required. “There should be duty waivers on them, the facilities should be given to us free to use. “We also go forward to requesting other organisations who have a strong CRS policy to support us because there are around 68,000 children roughly estimated to be born with this kind of congenital heart disease,” Sharma said.